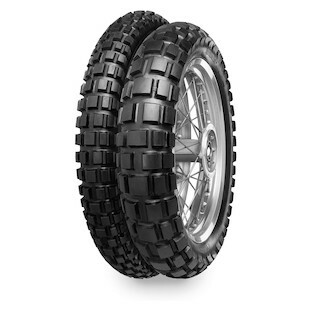 The Continental Twinduro TKC80 dual sport tire is street legal for most 600-1200cc DS bikes. Affordable and long wearing, these tires are 40% on road and 60% off road. They have a deep enough tread to handle loose surfaces like sand or mud yet get good grip on the tarmac and in turns. The TKC80's help to transform larger adv bikes into something more nimble off-road. They have excellent braking and traction on a wide range of surfaces from loose to hard pack. Made of a single compound with good cleaning properties, means mud or debris won't get trapped between treads. For other similar items see our Continental Tires page.